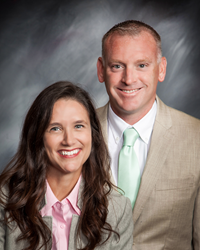 New owners, Brandy and Sam Patton, bring their personal touch to professional home care assistance in the El Paso area. Home Instead Senior Care, El Paso focuses on bringing a positive attitude to improving the home life of seniors. Brandy and Sam Patton recently acquired Home Instead Senior Care, El Paso and stated the difference in their quality of care from the previous owners, “Our families live and work in El Paso, TX, so we're invested in our community on a very personal level. We believe every senior in the area deserves to be happy with individualized, in-home senior care with a compassionate touch.” The Patton's opened their new home care location in 2015 after recognizing a need for quality senior care with over 90,000 men and women in the greater El Paso area being over the age of 65. Home Instead Senior Care El Paso employs a specialized team of personal assistants for seniors wanting to stay in their home and keep their independence. Their focus on safety and quality of life becomes an important factor in quality care not only for seniors but also for their loved ones. Home Instead Senior Care, El Paso’s personal assistants help seniors with day to day activities such as, meal preparation, social interaction, medication reminders, personal care and much more taking the stress out of care giving for the family. “To us, it’s personal” says Brandy and Sam Patton. Home Instead Senior Care, El Paso is fully insured and bonded and provides personal care assistance across El Paso County, including but not limited to, El Paso, Westside, Upper Valley, Sunland Park, Central, Fort Bliss, Canutillo and Vinton. Founded in 1994 in Omaha, Nebraska, by Lori and Paul Hogan, the Home Instead Senior Care® network provides personalized care, support and education to help enhance the lives of aging adults and their families. Today, this network is the world's leading provider of in-home care services for seniors, with more than 1,000 independently owned and operated franchises that are estimated to annually provide more than 50 million hours of care throughout the United States and 16 other countries. Services span the care continuum from providing companionship and personal care to specialized Alzheimer’s care and hospice support. Also available are family caregiver education and support resources. At Home Instead Senior Care of El Paso, its relationship before task, while striving to provide superior quality service. Deliver Media is a full service marketing agency helping national franchises with local marketing solutions. Deliver Media provides data-driven direct mail programs, SEO, SEM, video and social media management services specifically scaled for multi-unit businesses. Deliver Media has the experience and knowledge to develop a custom made media campaign that is cost efficient and effective. Deliver Media was voted “Best Place to Work in Tampa Bay” in 2014 by the Tampa Bay Business Journal’s Best Places to Work Awards. For more information visit: http://www.delivermedia.com.